Sandhill Cranes are beautiful birds. They have an elegance about them that endears them to people they share space with. 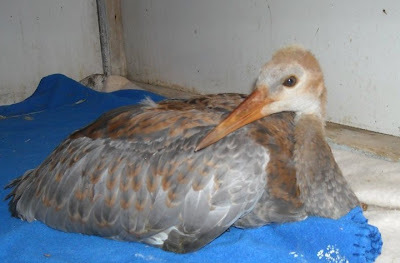 That was the case with a young Sandhill Crane recently admitted from Marshfield, WI. The family of cranes have lived on the property longer than the current landowner. The people loved to watch the crane family year after year as they lived the cycle of life before their eyes. The adults came back to the same place, same field and had the same habits. They had youngsters, but always only a single colt was hatched, until this year. The landowners were elated to see the cranes had two youngsters this year. They watched as the little ones grew up and approached the age when they too would be flying. Then... something happened. No one is quite sure what that something was but it could have been one of the young cranes was hit by a car. She managed to get herself onto the landowners lawn and there she lay helpless. The landowners were caring people and called REGI for help. They managed to get the young crane into a box. She was then transported to REGI. Once at REGI it was determined the youngster had a fractured pelvis and a sprained ankle. It is very important for cranes to say on their legs. Once they are unable to walk they lose not only muscle tone but bone mass as well. 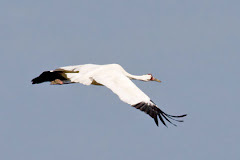 It is a race to get cranes back on their legs after an injury occurs that cause they to become lame or unable to walk. 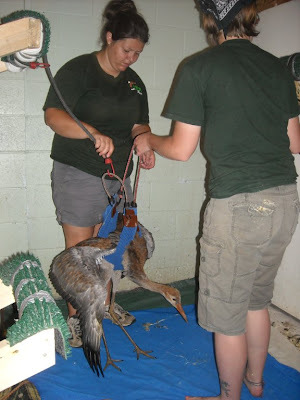 Once in the sling this young crane was reluctant to eat so was tube fed to maintain her nutrition. 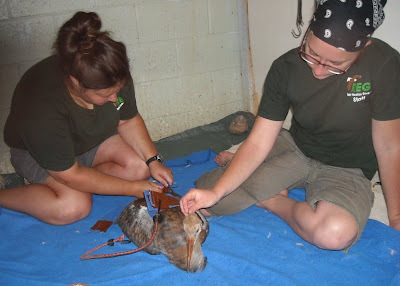 All the elements must come together for wildlife just as they do in human patients as we hope for a full recovery. Missing any one of those things from proper nutrition to exercise the patient would not have a good outcome. We are grateful to the fine family that helped this young bird by finding her help as soon as they realized she was injured.